Jesus stood among the disciples – after his resurrection – and said: Peace be with you; the disciples had several reactions, all at once: they were startled and terrified; even after Jesus showed them his scars from crucifixion, Luke reports that in their joy at seeing him, they were disbelieving and wondering. Many mixed feelings. A little boy came home after Sunday school and over lunch his parents asked him what the Sunday school class had been studying. He replied as follows: “We have been talking about the Israeli General Moses and the escape of the Israelites forces and camp followers from Pharaoh’s Egypt.” “Tell us more…” his puzzled mom asked. The disciples were told stories of Jesus resurrection and they had difficulty believing them at first. Additionally they were frightened when Jesus suddenly appeared in their midst. 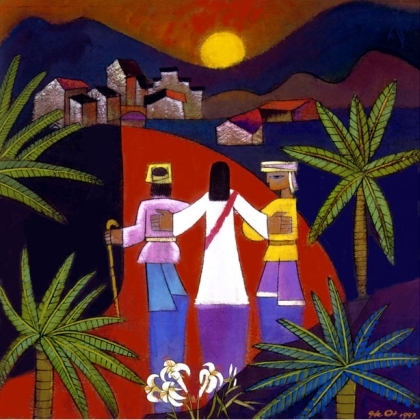 Earlier in Luke’s Gospel, some of the disciples had met a mysterious stranger as they trudged dejectedly towards Emmaus shortly after Jesus death on the cross. He asks them what was bothering them and they told him of the things that had happened the past few days. Their tone suggested that they too did not expect him to believe their story; nor did they as yet have another story to tell. That was yet to come. The stranger turns out to be Jesus whom they seemed not to recognize at first. They were not looking for him. They were looking at the ground; they were depressed and fearful. Only when he shares a meal with them do they catch on that it might be the risen Lord Jesus. Then they can tell the amazing story. But doubt is also present. And that is OK though sometimes painful. In today’s Gospel, which is Act 2, Scene 1, of the continuing story Jesus does indeed show up at supper while the Emmaus Road disciples are trying to tell the rest of the disciples about their meeting. Like the parents in the modern story mentioned at the beginning, the remaining disciples are not quite prepared to believe their brothers account. Even when Jesus utters that profound prayer: “May the Peace of God rest upon you” they are still unbelieving and are in fact terrified and startled, thinking they were seeing a Ghost, a Vampire. At this point they seemed unprepared to believe. For whatever reason, the disciples were not ready to change, to shift from a depression in which they could remember Good Friday and the crucifixion and all its horror and the burial of Jesus in the Garden tomb. They were stuck there. Jesus is patient with them. The growth of faith takes time even as it can for us. He showed them his hands bearing the marks of the crucifixion and his feet with the nail prints. Still the disciples were behaving like unrepentant light bulbs in the hand of a bewildered psychiatrist. Perhaps they still did not want to change. We may ask ourselves that question too, this Easter time. Do we want to change? What will it take? The sudden reappearance of Jesus was outside the disciples’ experience: it was new; it was almost frightening; they had never been exposed to anything like this. Jesus invites them as a community, to carry on his work – together, wherever they find themselves. He says: Peace be with you. Carry my peace with you and be instruments of real peace in the world. That is the invitation for us too. Wherever we find ourselves, there we will find Jesus; there we are invited to put his challenges first. Be a bringer of peace. Jesus senses the disciples’ disbelief and asks them “Have you anything to eat?” They gave him a piece of broiled fish and he ate it IN THEIR PRESENCE, right in front of them. He was no ghost; he was a hungry human, a resurrected one but human and alive. Jesus was there in the midst of the ordinary, Sunday evening dinner in Jerusalem. Never stop looking for Jesus. He’s here in plain view. He’s here as we gather to celebrate resurrection. He’s here as we share the Communion, a sacred meal. Here too in the wonderful coffee hours we have where we check in to see how absent friends are doing and how those who have returned enjoyed a trip or a visit with family. Open your eyes to see Christ in the usual, in the ordinary. He’s here. And he is there in the unusual, the extraordinary too, in the beauty of the spring time as the winter cold gives way to heat and rain and the renewed growth that settles into the summer greens. Resurrection invites us to believe in God’s promises and to bearers of Christ’s peace in places where peace is obscured. As you listen to friend who needs a sympathetic ear, so you restore peace; as you help with Habitat for Humanity, so you help create peace for those in need of adequate housing; as you contribute food for the food pantry you help bring peace into the lives of the hungry. You break down walls of separation and let peace find its way in our midst. And you can supply your own stories of how Christ’s Peace is shared. Peace is Christ’s resurrection gift. It is his first word to the disciples and to us. It is the rest of the meaning of Easter. Resurrection invites us to change for the better to see Christ in the people around us and to let ourselves be changed by God’s love active in our lives. O God, whose blessed Son made himself known to his disciples in the breaking of the bread, open the eyes of our faith, that we may see him in all his redeeming work; and in seeing may believe; and in believing may be changed and thereby empowered to do his will in all we undertake. Amen.